9th – 11th grade TN Team Pride-Black try-outs will be held on Sunday March 11, 2018 from 3pm – 6pm at Hooptown. We will have upper classman and lower classman opportunities. 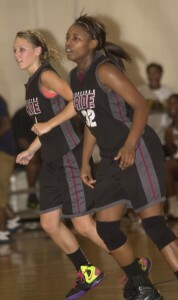 Tennessee Team Pride BLACK is one of the premier high school girls basketball clubs in the country. We focus on skills development and discipline inside a team framework which prepares our players for success at the college level. We have over 100 former alumni who have played at the college level and 2 former alumni currently playing in the WNBA.